"Great chili recipe for a very large crowd. Cook it in a 6 gallon steam jacketed kettle or a huge pot on the stove." Wash and sort pinto beans. Bring 3 gallons of water to boil in a 6 gallon pot. Pour in beans, return to a boil and cook 2 minutes. Remove from heat and let stand 1 hour. Stir in salt and simmer until tender, 90 minutes. Drain and set aside. Brown beef with onions and garlic over medium high heat in same pot or enormous skillet. Combine meat mixture, tomatoes, tomato paste, chili powder, cumin, pepper and cooked beans in 6 gallon pot; stir; cover and simmer 1 hour. 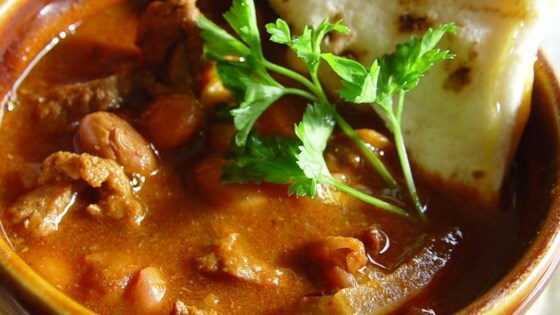 See how to make a simple, satisfying ground beef chili with red beans. I made half this recipe for about 40 people. Got lots of compliments on it. However, it wasn't spicy enough for my taste, so I added Cayenne pepper. I'll definitely make it again! It was a good basis for a simple chili if you don't have a mix packet; however, it needs more uumph. We added salt, more chili powder and more onion. After that, it was pretty good. The beans turned out really hard...they weren't cooked enough and i followed all the directions. One of the best chili recipes I've found in a long time!